As Marketing Show North 2019 comes to a close, we’ve put together a new ebook with some key knowledge from some of those involved. Last week’s Marketing Show North attracted over 3,700 attendees, a new record, and was a hive of high-quality industry discussion and networking. For both those who attended and those who couldn’t make it, this eBook contains in-depth insight from marketing leaders who were at the expo. Our next show at Event City is a special double-header: the eCommerce Show North and Tech Show North, which will take place over May 8th and 9th. You can register for that event here. The Marketing Show North will return in 2020 – watch out for a special announcement soon! Welcome to the first of our #DareToGrow podcasts. At AdRoll, we help ambitious brands to grow, and this series will shine a light on some of our most ambitious customers. We’ll hear their story, the decisions they’ve made, the lessons they’ve learned, and their ambitions for the future and doing that will hopefully, provide you with some perspective and inspiration that you can apply to your own business. Tone will be exhibiting at Marketing Show North this year. In the past, most businesses used a last-click attribution model to measure their campaigns. Last-click attribution gives credit only to the last marketing channel a visitor touches before converting. For example, let’s imagine that someone Googles a question. From the search, they click on a blog post, then download an eBook, and finally purchase a product or service. In a last-click attribution model, the eBook would get all the credit. Luckily, businesses are moving away from this model because last-click attribution doesn’t tell the full story about a customer’s relationship with their advertising. They are learning to take into account the influence of third-party referral sources, retargeting partners, and other marketing efforts on customers’ actions. First-click attribution: First-click attribution gives all credit to the first marketing channel a user encounters on the path to conversion—such as a search engine like Google. Last-click attribution: Last-click attribution gives all credit to the last marketing channel the user touches before converting. Linear attribution: Linear attribution distributes credit equally to each marketing touchpoint the user encounters. Position-based attribution: Position-based attribution gives 40% of the credit to the first touchpoint, 40% to the last, and 20% to the remaining touchpoints. Algorithmic attribution: Algorithmic attribution uses data and statistical modeling to assign credit to effective touchpoints. The best way to improve the effectiveness of your marketing attribution is to pair it with data-backed analytics. Data helps you strengthen your campaigns by showing you the performance metrics of the ads that convince your users to convert. Using both data and analytics enables you to manage how your user comes into contact with your brand—ensuring you reach customers in the right place and at the right time. This Think with Google piece goes into more detail on how to use attribution and analytics to better understand your customers’ experience across all engagement points. Am I taking into account all of my marketing touchpoints, or just the first or last one? Will attribution help my marketing department spend their dollars on the campaigns that drive results most effectively? Does my team have the expertise needed to use the attribution model that best suits our business, or should we consider looking into a third-party vendor? Am I duplicating my efforts by getting attribution insights from multiple different solutions? When someone visits your website, a tracking cookie—or pixel—is placed on their browser. This allows you to track where that user goes online once they leave your site, including social media and mobile, and helps you serve ads as the user moves through the consideration cycle. Once a customer converts, you can use your cookie data to see the path they took to go from visitor to buyer. If you’d like to see where more than 900 other brands and agencies stand on attribution, be sure to check out our State of Marketing Attribution report. The strategies and findings of the marketers we surveyed can inspire you and help your business to succeed with attribution. With over 10 years’ experience in the fashion and retail sectors, ICG’s Amy Young talks through a few key trends that should be on your marketing radar in 2019. Let’s start with ‘wellness’, a word you’re going to hear a lot this year. You might have seen or heard it muttered just a few times throughout January, a month traditionally associated with fresh starts and new beginnings, but it didn’t stop on the 31st. This year we’ll notice a shift towards well-being and wellness culture which is not just a fleeting trend. As we start to value our own sense of self much more and provoke change in lifestyles, well-being is now seen as a health status, something that boasts a sense of pride and belonging. Vogue noted that #SelfCare clocked up an impressive 10 million posts on Instagram in 2018. This, along with the rise of ‘athleisure’ – people wearing their gym kit to do the weekly shop – and lifestyle choices such as veganism and developments in the way we stay active, have catapulted wellness to the top of people’s personal goals lists. We’re all past the days of being ‘sold to’, to be preached about this and that – we want to see a level of authenticity from the brands we choose to spend our hard earned cash with. So in comes the old phrase ‘honesty is the best policy’. Don’t get me wrong, you still need to have a level of aspiration, but think about that honest undertone. Consumers are getting fed up with attention seeking gimmicks and copy being used for clickbait; they’re expressing a need for realism with truthful and engaging content. Not far from the authenticity trend, lies tone of voice. Dig deep and ask yourself what your brand stands for and how you’re communicating this to your audience. It’s easy to get caught up in the latest fads but it’s worth staying true to company values and beliefs rather than trying to be something you aren’t. You need to cut above noise, evaluate how you’re communicating and not be seen as boring to millennials or other generations for that matter! It won’t happen overnight, but start to evoke change and challenge internal conversations and you’ll be rewarded with your customers’ brand loyalty in the long term. *(Source: @RetailProphet, contributor to The Business of Fashion). Experience has been a bit of a buzzword over the past few years and the trend for consumers wanting more doesn’t seem to be waning. Look at creating experiences that involve your customers and offer a sense of achievement from events to in-store customer service. People are increasingly more conscious of their shopping behaviour; buying less and considering purchases more (we can thank Marie Kondo for sparking lots of joy and creating a wave of decluttering our homes and mindset) and we’re all craving physical experiences and creating memories. After all, if it isn’t talked about on Instagram did it even happen? Amy is responsible for managing a cluster of ICG’s shopping centre clients, overseeing design, digital and social media projects. She will be at ICG’s stand 149 on Thursday 28th February. For more info about ICG and the clients they work with head over to their website. Colewood will be exhibiting at Marketing Show North this year. When it comes to writing content for your audience, you want to make sure that the work you’re producing is something that they’re actually wanting to see. Part of this includes having correct grammar so that the readability is to a high standard. This applies to any sort of content you produce as a company; the quality of the information you choose to have published online is a massive reflection of how you will be perceived overall by your audience. An enormous downfall for a lot of sites is that the SEO makes sense in theory, however, when keywords are used in content with bad grammar, it can become an obstacle more than you may first assume. If you’re wanting to achieve a successful content marketing strategy, good grammar is definitely something to take into consideration. Think of it this way: if you received an article via email riddled with misused punctuation and spelling mistakes left, right, and centre, would you publish this work with a backlink if that’s what the sender was requesting? The answer is likely going to be no. The impression that grammatically incorrect content gives is not a good one, with many online businesses simply taking one look at the email and hitting delete. A lot of readers of your content may feel they don’t have the time to decipher what you’re trying to convey and click off. This can lead to a high bounce rate for pages on your website that contain unacceptable grammar. Correct use of punctuation (commas, full stops, hyphens, semicolons etc). If you can get these right, then your content should be seen as acceptable by the majority. As a consumer, navigating a website with poor grammar is something that is not usually overlooked. Particularly with ecommerce websites, bad grammar can ultimately lead to adverse effects on your revenue. Another implication is the reputation that your company may obtain. Ill spelling and grammar can typically be associated with spam websites or just all-round unprofessional companies. Hence why it is so important to proofread your content before distributing it online. There will be room for minor errors, but as a whole you want to ensure that you’re aiming for your content to be grammatically correct. Google will still be able to recognise what you’re trying to rank for even if it’s not conveyed in the most accurate way. Just make sure your content makes enough sense for your audience. For example, when conducting keyword research, you may discover that a grammatically incorrect term ranks rather than it’s proper counterpart. However, Google can comprehend similar phrases and will not disregard your content if there are slight alterations with grammar. So, do not deliberately make your grammar incorrect so that it ranks, because search engines already take this into consideration. The lack of the apostrophe in the search query does not affect the search engine results, as seen above. The “Did you mean” function allows users to correct themselves, but even without this, still lists related searches that are in fact grammatically correct. Times are tough in retail right now – particularly for those with a presence on the High Street. The Independent recently reported UK retail sales as showing the biggest decline in 23 years as consumers struggle with personal austerity measures. For retailers, the article does not make for pleasant reading and comes following a recent spree of announcements from major names in the industry announcing significant store closures (Marks & Spencer announcing 100 store closures and Mothercare announcing 50). In this climate, it’s never been more important for businesses to be innovative in their approach to both the in-store and online shopping experience in order to not only survive, but thrive. 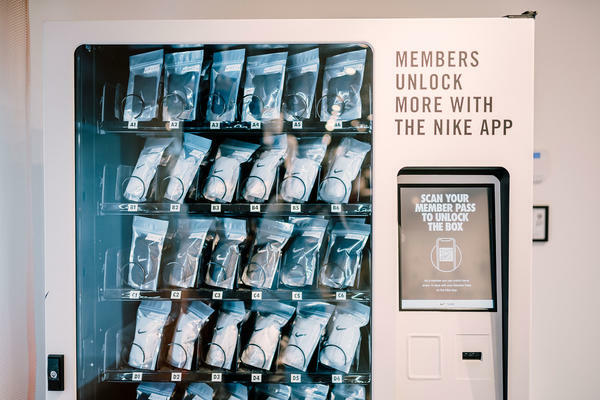 Nike has historically been forward-thinking when it comes to innovating its retail offering both online and offline. Its latest approach to delivering the perfect in-store experience has been lauded as ‘drastic’ and a ‘new age’ for retail – but when you think about it, it’s just plain logical – which means every other retailer should be learning from this approach – and fast. So what is this drastic, new-age approach to retail we speak of? Well, the elements of it are all encompassed in Nike’s new Los Angeles store – Nike by Melrose. Looks just like any other store – right? When we mentioned new-age, no doubt you were thinking of something that actually looks like it’s from the future… with robots or drones like Shutterstock always promises from the ‘future of retail’. 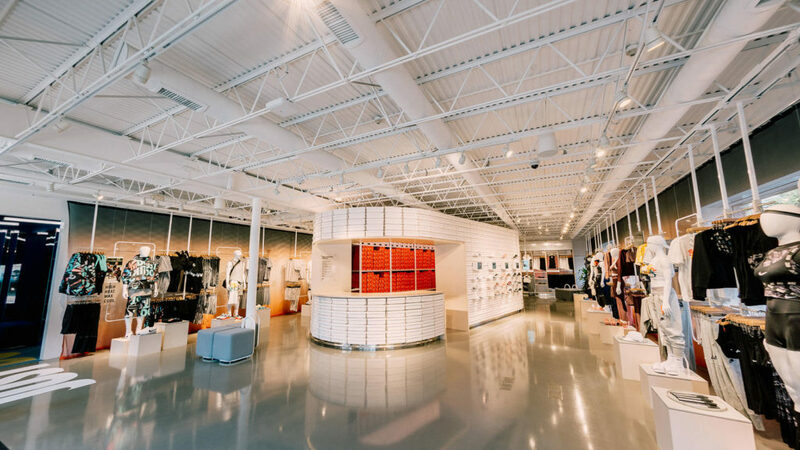 Its simplicity is the beauty of Nike by Melrose – it mostly just looks like any other store – but it’s how it’s run that differentiates it from its competitors. Using data to make decisions is a sensible strategy designed to make success more certain, but many retailers continue to only use top-level data to make top-level decisions about their business. Instead, dig deeper into the data you have at your fingertips to really learn about what customers want at a local level, then adapt your marketing and offering to be personally tailored to them. Nike by Melrose is named as such because it’s a store created, designed and stocked based on the shopping habits of local customers. It’s a store driven by data at a local level – and that’s what makes it different. The store’s location has been chosen based on insights gathered from NikePlus to give the retail outlet the best chance of success. New products give customers reasons to return to the store. 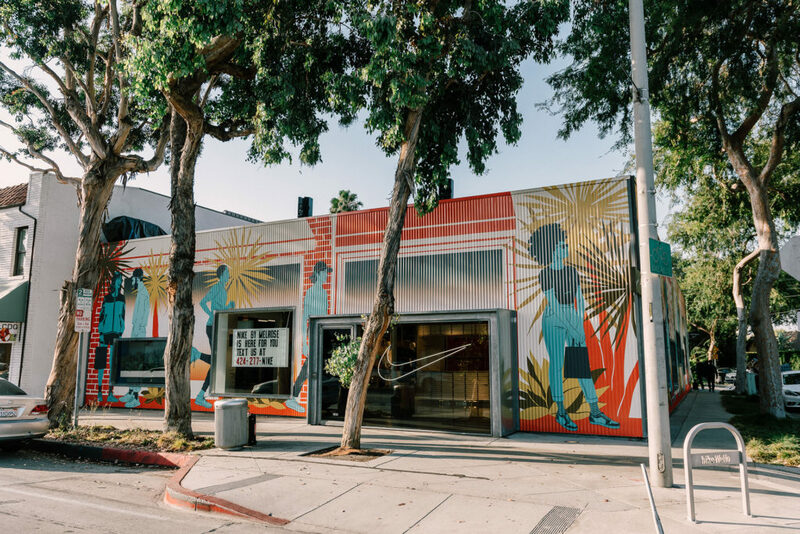 Much of the product stocked at Nike by Melrose – including 25% of the shoes – will rotate every two weeks – a move pioneered by Zara that has proved popular with consumers. Digital and ecommerce data from local shoppers will also determine which products are stocked and which services are offered in-store. Some of these products will also be unique to the store and are likely to never be sold anywhere else again. This brings a sense of excitement and urgency to the in-store shopping experience. The in-store service at this store is designed to perfectly balance the convenience of online with the experience that can only be offered in person. 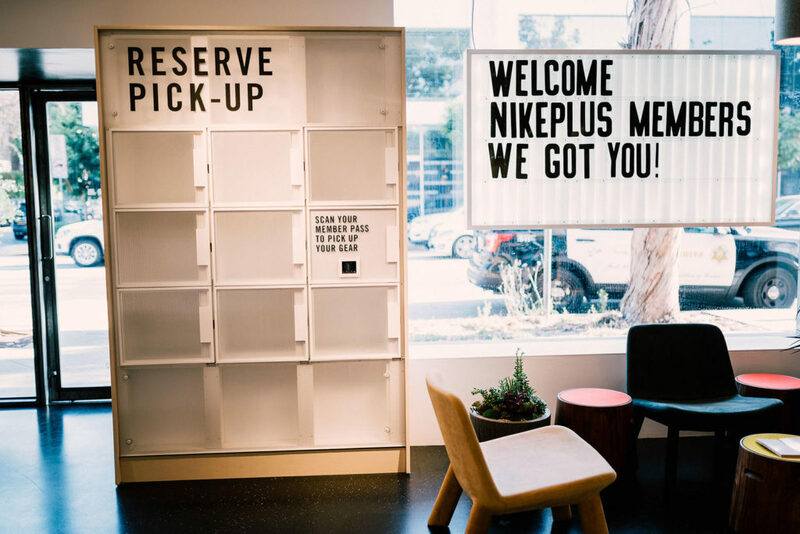 The in-store ‘Sneaker Bar’ lets customers get expert help in finding the right shoes for them, while Nike’s latest App – ‘Nike App at Retail’ – allows customers to browse and reserve products for immediate collection to avoid disappointment should there be no stock. This app also enables the store to recognise NikePlus members when they walk into the store and push awards and discounts to them. Better still, the store plans to integrate the ability to scan product QR codes and have every product scanned by the customer waiting for them in the changing room to try on. Again, the simplicity here is interesting. Instead of making customers use an in-store tablet or system, customers use their own phones – devices they are already very familiar with. And, encouraging the customer to have the phone in their hand allows them to push offers that won’t be missed by the customer. This store is the first of the brand’s new ‘Nike Live’ concept, built around delivering speed and digital offerings in-store and so we can expect more to come of this model. 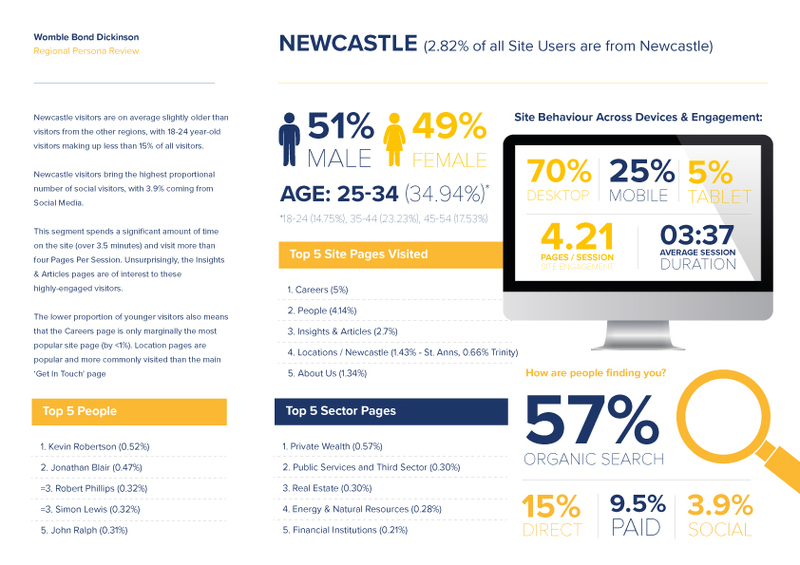 Data-driven insights at a local level can easily be obtained from your Google Analytics account by creating segments by location and identifying common behaviours and interests. These learnings can be used in a B2B environment as well as a B2C / retail business. We did just that for one of our B2B clients, Womble Bond Dickinson by creating location-specific personas for each of their office locations using data collected over hundreds of thousands of sessions. 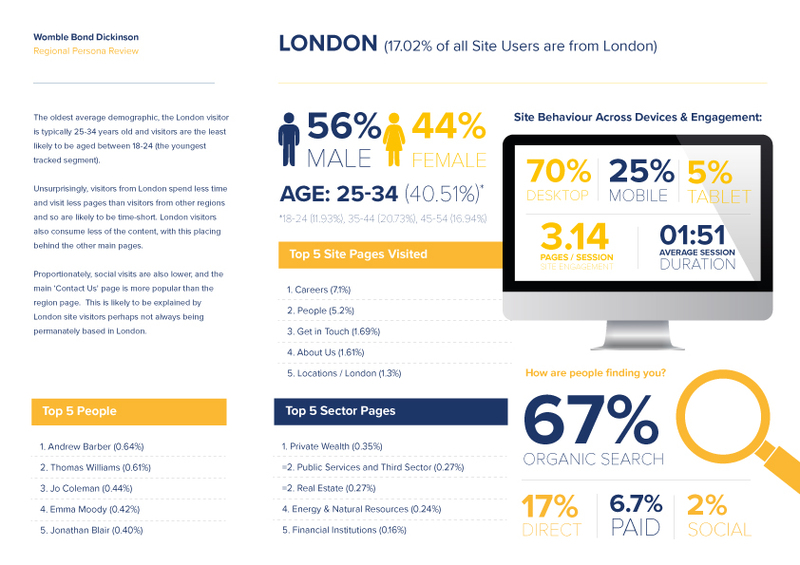 Each user segment from each location uses the Womble Bond Dickinson website in very different ways – and these insights can be used to inform marketing decisions, personalise content to more effectively target each segment and, ultimately, to generate more leads at each office location. Check them out below, and get in touch with us whether you’re a retailer or lead-generation-based business to find out how you can use data insights to improve customer experience and increase conversions at both a national and local level. CDS will be exhibiting at Marketing Show North this year. Usher, by MicroStrategy, replaces physical badges, passwords, and security tokens with digital badges delivered via smartphones. These digital badges lock down logical and physical assets without sacrificing convenience. Maru/Blue will be exhibiting at Marketing Show North this year.